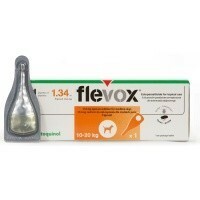 Flevox Medium Dog is a Fipronil based spot on flea treament for medium dogs weighing between 10-20kg. The treatment will remain effective for up to 8 weeks against new infestations and any fleas that land on your dog will be killed within 48 hours. This product has the same active ingredient and dosage as the Frontline products but at a much cheaper price. However as people have been noticing with the basic Frontline, it doesn't seem to be working as well as it used to. I used this on my dog 3 weeks ago as well as the cat version on my two cats. Within 24hrs I could only find dead and near dead fleas on all of them which was great but as of today I have found 4 fleas on my dog (after a quick 10min inspection) and 7 on one of the cats (after looking for about 15mins before she got fed up)I don't think this is a problem exclusive to Flevox though but instead with all Fipronil based treatments; I think in some areas fleas are becoming resistant to Fipronil. I will be looking at the other products available to find one with an alternative active ingredient. If you are using basic Frontline or similar Fipronil based treatments and they are working fine then this will work just as well for you despite its cheaper price.